Panzanella Sandwich - Inspired by the classic Italian Panzanella Salad, this incredibly delicious sandwich is piled with layers of summer vegetables, basil pesto, and mozzarella cheese. Combine tomatoes, cucumbers, pepper rings, onions, basil, balsamic vinegar, extra virgin olive oil, salt, pepper and garlic in a salad bowl; gently toss to combine. Set aside. Spread a teaspoon of basil pesto on each slice of bread. Add a slice of cheese on 4 of the bread slices. Divide salad evenly over each slice of cheese. What would you put on a sandwich made with eureka!® Organic Bread? Tell me in the comments for a chance to win a $100 Visa gift card! I would put Olive Loaf with American Cheese and mayonnaise on a sandwich which ismade with eureka! Organic Bread. I would smash an avocado and put on top whatever ripe fruit Spring’s bounty has provided! I would put fresh basil pesto, fresh mozzarella, and mounds of leafy Boston lettuce on it. DIVINE! Ham and cheese sounds like a plan! My all time favorite sandwich is egg salad. I would love to try it on this bread. I would put crisp bacon, slices tomato, cheese and avocado on Eureka bread. I would love smoked turkey, provalone, avocado, sliced tomato and leafy lettuce with miracle whip!! I would make my sandwich with pineapple chicken salad. I would put ham, lettuce, cheese & avocado on my sandwich with Eureka bread. I would make my favorite summertime sandwich; juicy garden vine ripened tomatoes, mayo, cheddar cheese and a touch of salt. I’d put olive oil, basil, homegrown tomatoes, and fresh mozzarella on the sandwich. I would put almond butter and raspberry jam! I would make a turkey, avocado, and cheese sandwich! I’ve recently tried Eureka! bread and it was so good I went old school with a peanut butter and jam sandwich I think another sandwich I would make is a smashed chickpea one. I would make a roasted turkey breast and swiss cheese sandwich with avocado, lettuce and tomato. I would make a turkey, bacon and cheddar cheese sandwich. I would make a BLT with the eureka organic bread.. bacon, lettuce, and tomato. I would put bacon lettuce tomato and mayo on the Eureka bread. Your sandwich looks great but I’m a meat gal, so a tuna sandwich or adding some salami OR pepperoni OR smoked ham to your classic Italian Panzanella Salad and a good time could be had by all….. This bread is delicious with almond butter and strawberry jam! We’ve had it! I would put avocado and a fried egg on eureka!® Organic Bread! Chicken curry salad with grapes and raisins! I would make a grilled cheese sandwich for my daughter. I would put turkey, bacon, avocado, lettuce & tomato on a sandwich made with eureka!® Organic Bread! Thanks for an awesome giveaway! I would put coconut oil peanut butter, chia seeds, banana and pumpkin spread on the #Eureka! Organic Bread! Looks so delicious!! I would put avocado on it, everything is better with guac! That looks amazing! All those fresh veggies look amazing. I think I’d make my avocado egg salad to pair with this. Gotta try this bread. I’d put turkey, bacon, avocado and spicy Dijon mustard on my sandwich! Your sandwich looks delicious! I love fresh tomatoes on sandwiches. 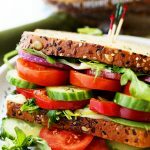 Love the idea of a salad sandwich using toasted Organic’s bread. I’d make a veggie sandwich with arugula, hummus, cheese, onions and cukes! I’d make a BLT. I’m sure one would be awesome with this bread! I would make an open faced tuna melt with tuna, american cheese, lettuce, tomato and a little onion. A BLT sounds good… hmmm… yup, that’d be it! I would make a BLT with Eureka bread. What a creative idea! I love panzanella and making it into a sandwich is genius! Peanut Butter and Jelly is a fave in our home! I am a serious sandwich lover. I would do turkey, ham, salami, tomato, lettuce, two types of mustard, potato chips, avocado, salt + pepper. This is not a healthy sandwich, but it is GOOD! i would make a bomb grilled cheese!! I would make a grilled cheese with spinach and tomato. Now this is one glorious sandwich! Love all those fresh veggies! I’d put peanut or almond butter and banana slices on eureka!® Organic Bread. I would put Mayonnaise, Mustard, Smoked Turkey, Sharp Cheddar Cheese, Lettuce and Tomato on my eureka!® Organic Bread. I would put ham and cheese. 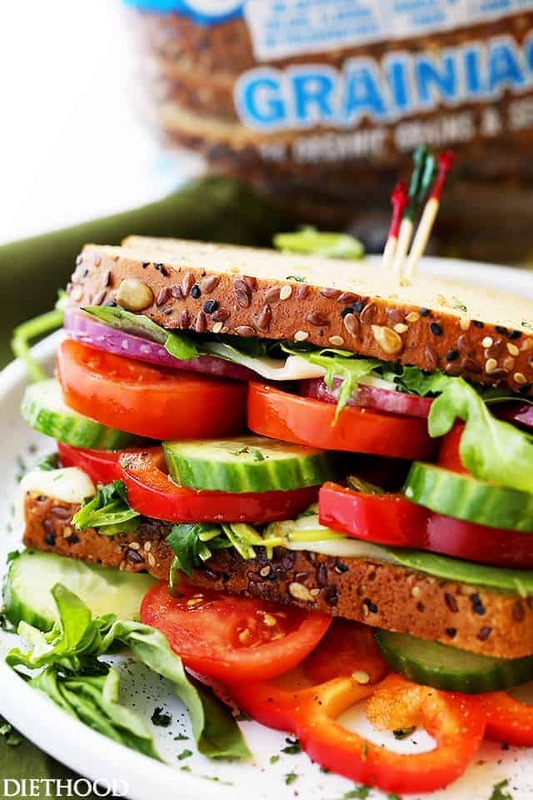 That is one perfect looking sandwich and we love that eureka! bread!!! I’d make a tuna salad sandwich – my favorite! I am all about your life goals! This sandwich is definitely a delicious pile of food! Food that I want right now! Looks amazing! I’d put on cucumber, avocado, tomato, lettuce, mushrooms, peppers, cheese and mayo. I would make a turkey avocado sandwich! I would put egg salad and spinach leaves. I would love to make a egg salad sandwich with lettuce and tomato on toasted bread. This bread looks and sounds so delicious. We got to give it a try. Thanks so much. We love this bread! I have and would use it to make the best grilled cheese EVER! I would put white bean artichoke and basil on a sandwich made with eureka!® Organic Bread. On a a sandwich made with eureka!® Organic Bread I would put some turkey breast, plain Greek yogurt, lettuce, and pepperjack cheese! YUM! This sandwich looks incredible — seriously drooling here! I shared on Twitter: https://twitter.com/FireRunner2379/status/736594515881037825. My sandwich made on eureka! Bread would have brie cheese, prosciutto, arugula, basil pesto, caramelized onions and fresh grated Parmesan. I’d toss it in the panini press to make everything warm and cozy! I would put healthy turkey, cheddar cheese, tomatoes, lettuce and mayo and mustard. This bread looks delicious! I’d put bacon, spinach, hardboiled egg, and cheese! I would add turkey, tomatoes, and mayo onto the eureka!® Organic Bread to make an awesome sandwich! This looks so good. I would love to add bacon and provolone cheese. I know the bacon isn’t the healthiest choice but it would be so good. I would love to have a pastrami and Swiss cheese sandwich. I think this bread is crying out for some egg salad! In honor the f Memorial Day and my fave is crunchy shrimp salad sandwich or a creamy lobster salad both with avacodo and heirloom tomatoes! Delicious! I would put chicken salad, arugula and tomato on the sandwich. I would put turkey and avocado on it. I would put pickled red onion, turkey bacon, avocado, nonfat plain Greek yogurt, salt and pepper, romaine lettuce, tomato, low-sodium deli turkey breast and English cucumber on a sandwich made with eureka!® Organic Bread. I would love to try this bread with turkey and swiss! I love healthy breads loaded with grains and seeds. I never could understand people who eat plain old white bread. I’d put a half dozen very thin potato chips on it. I would put pastrami with avocado and swiss on this. This bread looks so good! i would put turkey,mayo,swiss and avacado on it. Would. Make. Pastrami. With. Sauerkraut. Or. Rubens. Mmmm, sandwich looks delicious. I might add some slices of prosciutto. I love grilled cheese with pickles! I would have a tomato sandwich. Sliced tomatoes with mayonnaise. I would put roasted red peppers, roasted mushrooms, spinach, mozzarella cheese and pesto on my bread! This bread looks so good,I want to try this. I would put on roast beef, provolone, lettuce and tomato. I would put roasted turkey slices and cheese. This sandwich sounds really good. I have never heard of the Eureka brand of bread. I will have to look in the local store but not sure if they carry it and the only other place we have to get groceries is Walmart and I have not seen it there either. I make all of my own baked goods so that is probably why I have not noticed. Thank you for the opportunity! Love the sandwich you created here. It is almost the exact sandwich I order when I splurge for lunch out. I would use turkey, avocado, bacon, tomato, and a spicy mayo. Turkey, avocado, jack cheese, and mayo. I would add a wonderful egg salad on my sandwich. Avocado, Sprouts, Tomato and provolone! What would I put on this sandwich? Fresh tomatoes and mayo! I would make a big yummy club sandwich with turkey,cheddar,lettuce,tomato,spicy mayo,pickle,and my favorite crispy bacon! yum! Because this delicious bread deserves the best! Peanut butter and apple butter. And bananas. I would make an egg salad and tomato sandwich. You win the Internet with that good looking sandwich! When you can make a sandwich from basically stepping out to your garden for the ingredients then it will be amazing for sure! I love this! Avocado and tomato for sure…maybe an egg on top. Yum! I would put Tomato, Lettuce, Avocado, Mayo and mustard. I would put turkey, cheddar cheese, tomatoe, lettuce and mayo and mustard. This bread looks so delicious! I need to try it. I would put avocado, sprouts, and tomato on the sandwich.